Book 2 Weeks Of Beginner Pilates Classes With Us Now! * 1 Class Per Day for 14 days. Only valid for new members only. Pilates isn’t a fad. It’s a systematic approach to health and wellness PROVEN to make you stronger and more flexible. Here at Pilates Fit Perth, we work with you to increase your fitness and help ease health conditions and injury symptoms. We do that through our extensive experience and passion for Pilates and our expertise in helping people of all ages and fitness levels learn the art like we have. We have cultivated the best programs to work your body in a way to gain maximium results. So book, attend and get the sculpted Pilates body you have always wanted. But we don’t stop at the purely physical benefits. We also combine a range of other therapies and approaches to help our clients cultivate a calmer, more positive mindset to go with their improved mobility and strength. You’re on our page today because you’re looking to start your own Pilates journey. That’s why we’ve created our 2019 Perth Pilates Beginner Program. We’re offering you a full month of beginners classes with a complete money-back guarantee. You’ll join a small class of fellow beginners and learn a range of easy‑to‑master techniques. Even the basic principles you’ll learn will help you improve mobility, co-ordination and strength. You could also lose weight and relieve stress. Find our more about our guarantee by contacting our studio. Learn With Other Pilates Beginners From Teachers With 20 Years’ Experience. Pilates Fit Perth is a community of Pilates professionals who specialise in evidence-based instruction for all skill levels. Learning from the first group of clinically-trained Pilates instructors in WA. A huge variety of traditional and fusion training techniques like Pilates Mat, Pilates Reformer, TRX Suspension, Barre, Yoga, Pilates Stretch, Boxilates (we offer 75 classes across our two studios!). The psychological benefits that come with focusing on your strength, agility and mobility — we help our clients feel more confident and calm in their body. 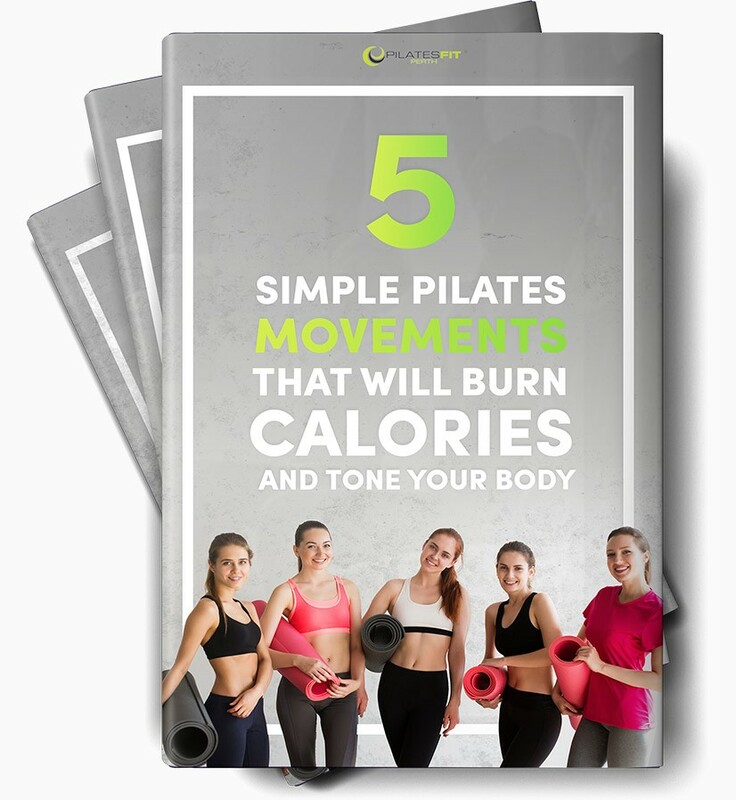 In this e-book you will find 5 simple pilates movements that will help to burn calories and tone your body – achieving the body of your dreams with 5 simple movements! With so many gimmicks and diet plans out there, it can be hard to know what will work for your body. That’s why we have created this guide – to help you get back to basics with 5 little known, yet simple Pilates movements to help you on your dream body journey. No matter what that is! Simply fill in the form below to download you copy. A Stronger, Toned & Flexible You In One Month Or Your Money Back! We can TELL you how experienced and committed we are to helping you reach your goals with Pilates. But we’d rather do something to show you how passionate we are about our clients’ results. If, after your introductory classes (see below), you become a Pilates Fit Perth member, you’ll have a full 30 days to test our studio and instructors. If, after that first month, your fitness and strength results don’t show an improvement, we’ll refund every cent of your membership fee. Dont forget to ask us about our guarantee at our studio, on becoming a member. If you know you’re ready to give Pilates a go, great! You’ve found the perfect way to test the huge range of physical and psychological advantages for yourself. Because for a limited time (while our limited spots last), we’re offering you a week’s worth of beginner classes. Simply complete the form below, let us know which studio you’d like to attend, and we’ll be in touch with details. You’ll be under no obligation to continue as a paying member. We can’t wait to meet you and show you the first steps to making Pilates part of your new, healthier life!